Home Targets Media Various Various Items SAXON 15-45x52 Zoom Spotting Scope - Special Offer! Special Spring Offer - 69.95USD instead of 89.95USD. While stock lasts. This innovative new design in a very compact zoom spotting scope has solved the problem of toting bulky scopes afield. The collapsible design has a 15-45x magnification and 52mm pull out and push in objective with fully multi-coated lens for greater clarity and light transmission. The large 52mm objective lens has exceptional light gathering capabilities for better viewing in early or late light. Hunters, Shooters, and birders who travel off the beaten path will appreciate the rubber armoring and compact design that make it easy to stow in any range bag or back pack. 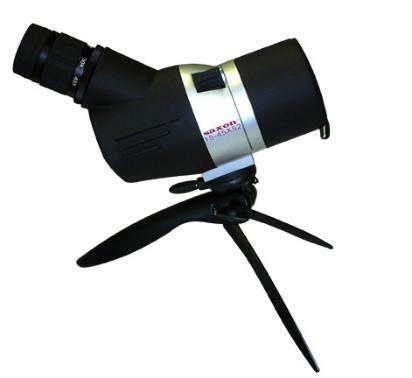 The perfect all-around optical instrument! Includes mini table tripod and soft zippered carry case.